Richard Graham’s life changed forever on a January day in 1995 when he was diagnosed with AIDS. Having recently lost his family, Richard feared the absolute worst—that he was going to die alone. But when Richard was at his lowest point, he found his life’s calling—to serve others affected by HIV and AIDS. 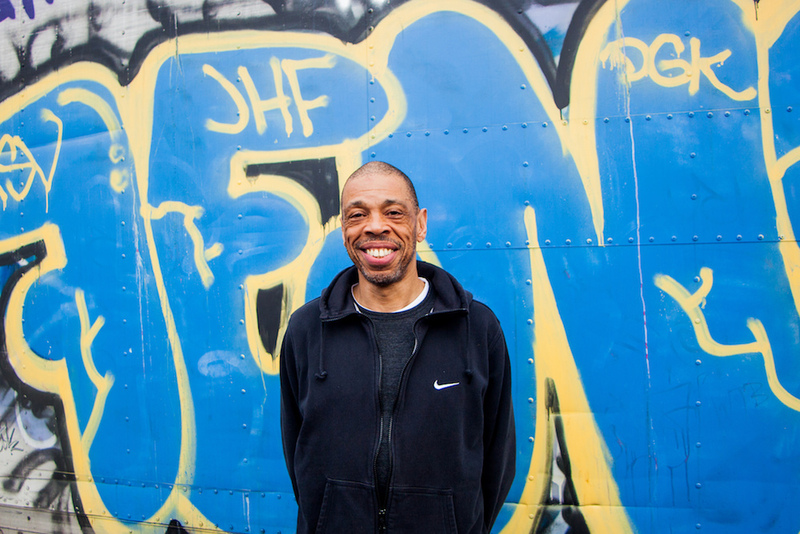 At the Momentum Project, a food and nutrition program in the South Bronx, Richard has been serving those with HIV and AIDS for the past 20 years, and he regularly serves at Momentum alongside buildOn students from New York City. Richard is now the Peer/Advocate employee at Momentum. He recently shared his inspiring story of service and the impact buildOn students have on others in his speech at the 2017 buildOn Gala, and today, on World AIDS Day, we’re sharing it with you. I remember the day I was diagnosed with HIV as clearly as if it was yesterday. I was sitting across from a nurse and she told me that I was HIV+. My T-Cell count was about 125. I was devastated. Anything below 200 is AIDS and irreversible. The nurse was talking to me and I was looking into her eyes but I couldn’t hear a word she said after she told me the T-Cell count. I knew that the AIDS diagnosis was a death sentence. My mind went blank. Once people knew I had AIDS, they didn’t want to shake my hand. Even the doctors didn’t want to touch me. Once people knew I had AIDS, they didn’t want to shake my hand. Even the doctors didn’t want to touch me. This was the first time someone held my hand since I was diagnosed. But, Dorothy kept holding my hand and, slowly, it stopped shaking. My fear dissolved in the warmth of her compassion. That was the first time I had real human contact in nearly two years. Above: A native of New Jersey, Richard moved to New York City in 1986. He describes himself as having a “rich and full life” before he started to feel chronic weakness and fatigue in the early 1990s. I came back to Momentum the next day. Not because I needed food but because I wanted to thank Dorothy for her kindness. After I thanked her I realized that I wanted to be like her and serve others. Not long after that, my T-Cells dropped below ten. I was in intensive care. They decided to try the newest anti-retrovirals on me. No one knew if they would work on me because I was so far gone. And for days I was teetering on the edge of death. But then I started to rise. I came back to life and the doctors were astonished. So what brought me back? The doctors didn’t think I’d survive and they couldn’t tell me how it happened, but I know what happened. God put Dorothy in my life and through her, I felt the power of service and compassion for the first time. And I became deeply inspired to serve others with AIDS. Today, I see that same sense of hope spread to the people at Momentum by the buildOn students. Ultimately, I survived because of service and because of Dorothy. She gave me hope and service gave me a reason to live. Now I’m the person that welcomes the clients. I’m the person that takes them by the hand and tells them “everything is going to be alright”. 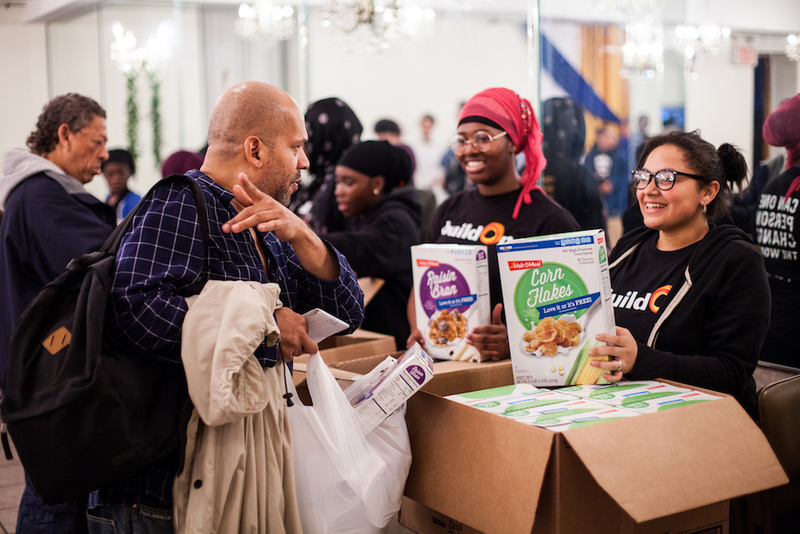 Above: buildOn students from the Bronx regularly serve at Momentum by sorting and disturbing food, as well as spending quality time with the clients. Today, I see that same sense of hope spread to the people at Momentum by the buildOn students. When most people see a bunch of teenagers walking down the street, they cross to the other side. And let’s be honest, lots of people think that the kids are dangerous. buildOn students are different. They shatter those stereotypes. But as soon as the buildOn students come bounding down those steps, the room shifts—it’s like a light comes on. But I don’t think the students fully realize what they mean to us when they volunteer. Before any of the clients come to Momentum we are afraid. Stigmatized. Alienated. But as soon as the buildOn students come bounding down those steps, the room shifts—it’s like a light comes on. They serve meals. They sit down and talk to the clients. Above: Richard speaks with buildOn students and buildOn’s Founder, President & CEO Jim Ziolkowski during a service project at Momentum. Doing service gave me the strength to transcend my own fears so I could start living again. 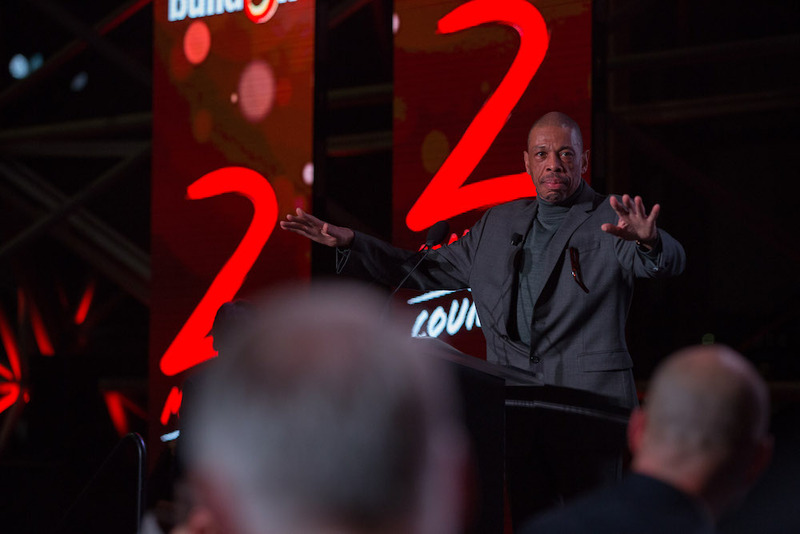 That’s the power of service—it doesn’t matter if you are on the receiving end or the giving end—and it doesn’t matter if you’re an adult with AIDS or a fifteen-year-old student from the South Bronx—service gives you resiliency so you never give up. Service gave me a reason to live. And buildOn students live to serve. Service gave me a reason to live. And buildOn students live to serve. I am living proof of the power of service, and it gives me so much hope to think about all of the lives buildOn students have impacted through their service. By supporting our students, all of us together are showing that we will never give up. Below: Richard received a warm welcome and a standing ovation at the 2017 buildOn Gala in New York City.